Payment delays or rescheduling schemes are currently on an upward trend, as producers are facing cash pressure due to heavier working capital requirements. 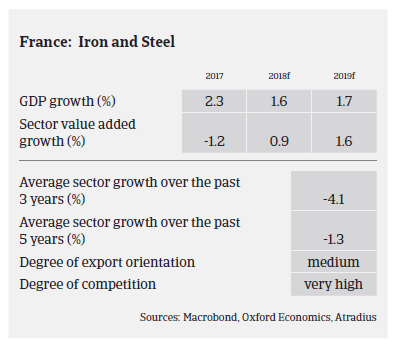 In 2017 and H1 of 2018 the French steel and metals sector benefited from higher sales prices, coupled with dynamic demand from construction and automotive as well as a rebound of agricultural machinery. Revenues increased by 2%-3% on average, and operating margins of businesses have improved. That said, steel and metal businesses dependent on the oil and gas industry (mainly in the special steel manufacturing segment) continued to suffer from subdued demand. The French steel and metal sector is just marginally impacted by US import tariffs (the US market accounts for only 4% of French steel and metals exports). However, in H2 of 2018 the situation for steel and metal businesses has started to deteriorate, due to lower demand from the construction sector, a generally decreasing business climate, increasing competition leading to lower margins, and the fear of price decreases triggered by excessive global supply. 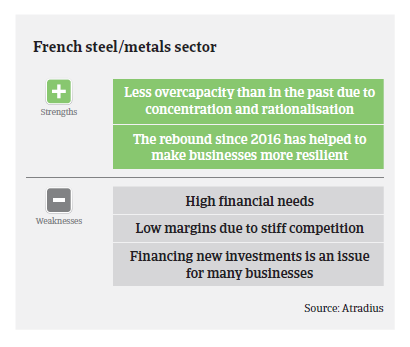 Overcapacity remains an issue in French steel trading activity, despite falling to 15% from 25% a couple years ago following continued business consolidations and rationalisations. Operating margins generally remain low for many small players, especially smaller steel/metal traders, wholesalers and processors. Some smaller businesses, however, are able to operate in niche segments that provide higher margins. Steel businesses are generally highly dependent on bank finance, due to high capital expenditures when operating upstream, and/or the need for short-term facilities to finance working capital requirements and inventories. 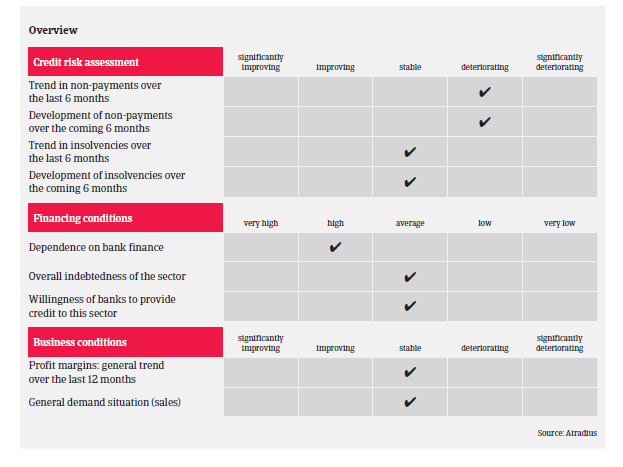 Currently the willingness of banks to provide credit to the sector can be described as neutral. 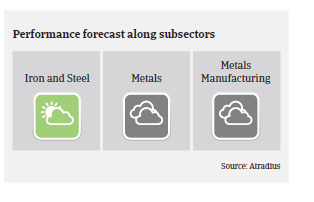 The insolvency level is expected to remain low in 2018 and 2019, mainly because many steel and metals traders and wholesalers are able to adapt with a flexible cost structure. That is unless they have a high level of inventories to finance. However, payment delays or rescheduling schemes are currently on an upward trend, as producers are facing cash pressure due to heavier working capital requirements while not always having adequate liquidity at hand. Our underwriting stance is generally open for the iron and steel and the metal recycling segments. The latter has experienced a strong rebound in 2017 and 2018 after two difficult years, with higher sales and improved margins. As many businesses in the general metals segment suffer from fierce competition and higher working capital requirement, our underwriting stance is neutral. The same accounts for metals manufacturing, where capacity problems, cash flow pressure and difficulties absorbing new investments are issues. Our underwriting is more restrictive for the steel foundry segment, which is facing difficulties due to overcapacities, a heavy cost structure and high production costs. In the steel and metals industry, where both overcapacity and volatile prices are a concern, conditions can change quickly, especially if decreasing revenues and margins are not bolstered (in time) by cost management. Prudent inventory management has become a key factor for cost optimisation and absorbing sudden price decreases. Many producers are under pressure to either expand/grow or refuse orders, while difficulties in hiring skilled staff impacts further business expansion. Despite the ongoing upturn, automotive suppliers at the lower end of the value chain face elevated debt levels, strong competition and price pressure. After an increase from 43.5% in 2017 to 47.5% this year, France has the second highest percentage of overdue B2B invoices in the Western European region.